I lived in Elsternwick once, and since then have always envied residents there. Everything’s there: supermarket, lots of shops, restauraunts, train or tram to city, bus to the beach. And a cinema: The Classic, which originated in 1913, and thanks to investment and renovations in the 90s, survives (and thrives) today. Bentleigh, where I now live, once had a cinema, next to the station. What became Bentleigh Hoyts originally opened in 1928, and ran until 1984 — later than I thought it might have survived. From the looks of the photos, a marvellous art deco building. A little bit of the facade on Nicholson Street survives, but it’s now offices of a real estate agent. What a shame it closed. We have heaps of real estate agents. A cinema would have been terrific to still have in the neighbourhood. I *think* I went to it once (though it was not really in my neck of the woods). Camberwell used to have at least one other cinema other than the Rivoli complex. It was up the hill from Camberwell station and (if I recall) just before where JB Hifi is now. I recall seeing Mel Brooks’ “Silent Movie” there and a few other films. The increase in more local cinema complexes has been a good move, but I still love the old art deco operations. Wot’s the problem? DRIVE to Southland! Phillip, it can’t reopen. Look at the pictures. Most of it has been demolished. Not being born and bread in Melbourne the only experience I had with a suburban cinema was the one in Chelsea that was opposite the railway station. One year on holidays we went to see a film there – I think it was Raiders Of The Lost Ark – and every ten or so minutes the sound would be drowned out by the ding ding ding from the crossing and the train rumbling through. Now you mention it I remember seeing The Muppet Movie at a cinema on the corner of Glenferrie and Dandenong Roads, Malvern. May have seen others there. We also often went to the Vahalla when it was in Richmond. But I lived in Chelsea and loved our Cinema there, it had wooden floors that really did make a racket when you threw the jaffas down. If you saw a Saturday matinee, they only opened the top dress circle, so only a few kids could come in! They really made the movie an experience, unlike the Multiplexes of now, so sad that they are gone. How about the Astor theatre in St. Kilda?? It is still there and plenty busy. The first time I went in to see a movie I was very surprised at just how large it is inside. It dosen’t seem to look as if it could be that large from the outside. Most of the seating is actually upstairs. The building itself is beautiful inside with many original 1930’s features still in place. The theatre is also home to a friendly calico cat who greets you in the lobby. I read somewhere that the screen is one of the largest if not the largest movie screen in the southern hemisphere. Seeing a movie there is really an experience. It can reopen somewhere else in bentleigh. That wouldn’t be a reopening, that would be a brand new cinema. It’s not the same at all. I think I saw one or two there myself. During my final years of high school and first few years at uni it was a regular haunt for myself and friends of mine. And this was pre “Blues Brothers” midnight screenings. As a child I also was taken to news reel cinemas in Melbourne – places you’d see ‘World News’ on the big screen before the TV did that for us (gosh – they must have been on their last legs then). Suburban cinemas here declined rapidly after the advent of television and – even after the rebirth of cinema-going in the eighties – still continued to close as the era of the multiplex dawned. Amazingly, or “local” cinema at Quinton is still open, still showing first runs and has fought off competition from several multiplexes. It remains a mystery to me how it does it. That said, although it’s “local” (about 3Km from home) it’s a bit too far to walk and because of the way buses are arranged, it’s not readily accessible by public transport. So when we go (which isn’t as often as I’d like), we drive. 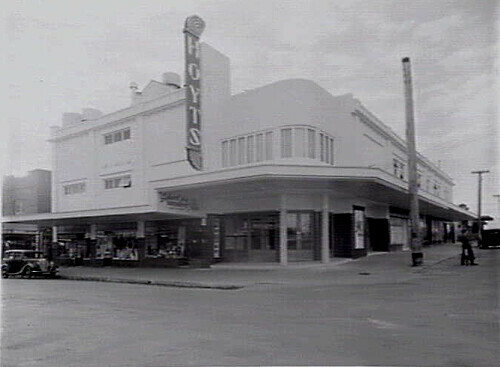 I’m very interested in cinema architecture and especially love art deco, so the picture of Hoyt’s in Bentleigh was a particular pleasure to see and thanks for posting it! Yeah, a handful of smaller suburban cinemas have survived. The aforementioned Classic (Elsternwick) and Astor (Windsor). Another outstanding example is the Yarraville Sun, also a beautiful art deco building. The common theme here is that investors have put money in to maintain and restore the buildings, generally while also extending to ensure there are enough screens to keep the operation viable against the multiplexes run by Village and Hoyts. Most seem to have cottoned-on to showing a mix of mainstream new movies and niche titles. The Astor specialises in older movies (often remastered versions). Bentleigh cinema was a dive (as was Hoyts Malvern) and was worn out years before it closed. Do you honestly think the City of Glen Eira would actually allow a cinema again in Centre Rd? They would demand a huge car park and the locals would scream about the intrusion into their streets of cars from elsewhere. What surprises me is that Target still limps along in Centre Rd; paint peeling off the ceiling but – to think – a drapery store – in Centre Rd in 2010! The Astor is regrettably a commercial failure. Only continues now because it is part of the campus of nearby St Micheals these days. If St Michaels hadn’t bought it , the Astor would be a memory now. Thanks Alan. Yes I suspect a lot of the suburban cinemas got to the point where they needed a lot of investment to renovate/modernise and survive, and it just couldn’t be justified. I don’t think parking would have been a big problem if the cinema had survived. The station carpark across the street is largely empty at the times cinemas would be busy, eg after dark on weekdays, and on weekends. I should have know you’d be onto this Daniel, when I did my search after having this pic come up in my (fairly regular ) Bentleigh history searches – I was imagining an entirely different location though – suspecting the buildings on the cnr of Centre & Jasper ( have you seen their weird little poster windows – I always thought they were reminiscent of a cinema past ? ). Maybe I should join the historical society.. hmm.. The HODGES is such a disappointment. WHY did they demolish the top storey of these buildings, WHY? And only ’84? Wow. recent.. Thanks Lea. I hadn’t noticed the poster windows in the photography shop, but just a coincidence I’m afraid! I do wonder if the columns at Hodges are the originals. Yes, it is a shame the building didn’t survive in some form.